Had this at Amy's when she hosted Mah jong. Excellent. I will want to make it for myself. She served it with another salad from the Red Rooster cookbook - also fabulous. See Rutikazooty's notes below. 10 minutes for cooking carrots does not leave them with crunch. Just a warning to check at 5. Based on reviews I used 1/4 tsp cinnamon. Nice blend of spices. Had the preserved lemons and used fresh carrots (with their green tops) yet I found it did not have the drama in the mouth of many of his other dishes. Will try again, this time with farmers market carrots when they become available as so many of you recommend it. 6.15 660g. Had warm - delicious. This was my first time using preserved lemon, and unfortunately, I don't think I care for it. If I make this recipe again, I'll sub something else salty, like olives or capers. I reduced the cloves by half because mine were freshly ground and very strong. Next time, I think I'd reduce the cinnamon a little as well. I tried this both hot and cold and I strongly preferred it warm. I am on the fence as to whether or not I would make this again. Fabulous! I also subbed out lemon zest for the preserved lemons, and I didn't have any green chiles, so I added a bit of harissa. Perfect foil for my tangine of short ribs, prunes, dates & olives. Terrific. I had no preserved lemon so used a bit of grated rind. The spices were perfect. This was a nice side dish to serve with a tagine. I didn't have any preserved lemons, I think the dish missed them. I served this with the suggested freekeh pilaf - they worked well together and I appreciated the addition of yoghurt to this dish. There is a long list of ingredients but it is easy and worth making. Delicious. The contrast between the room temperature carrots and the cold yogurt is wonderful. The flavors blend together really nicely and it's visually beautiful, too. Super! A great way to use carrots from the garden. Kind of out of my comfort zone, and i loved it! Very flexible recipe, delicious lots of ways. Haven't made it with preserved lemons yet, but used lime juice once and chopped fresh lemon another time. Both very tasty. We really liked this salad. I made it when I made the lamb and apricot tagine from AMFT, thought the salad was better than the entree. I used whole baby carrots instead of slices. I added the spices part way through the onion saute as I think that really releases their aromas. I served the yogurt on the side. 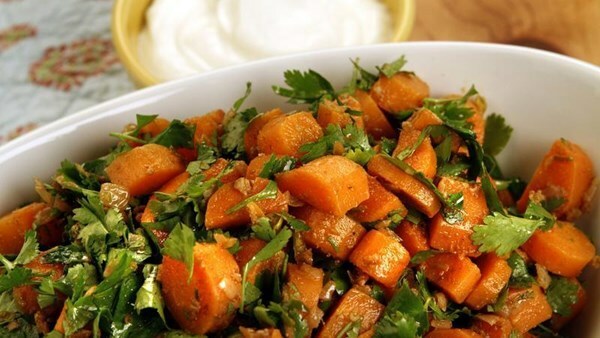 This recipe is rather similar to the Moroccan carrot salad in the ENYT Cookbook, with less time needed for marinating. I liked them both.